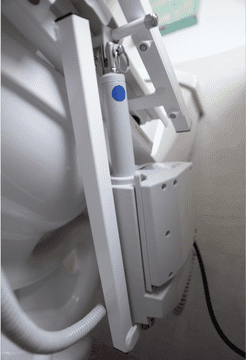 The TILT® Toilet Incline Lift from EZ-Access eliminates the need for a rickety elevated commode. Handheld control unit to operate the lifting process. Hand Grips feature non-slip covers to ensure a secure grip while the seat raises and lowers. Compatible with round and elongated style bowls with heights ranging from 14″ to 21″. Accommodates individuals ranging in height from 5’2″ to 6’4″, weighing up to 325 pounds. The unit attaches directly to the bowl and allows you to move 7½” forward. This positions your shoulders over your feet for optimal balance and positioning. This allows for your arms remain at the ideal positioning angle, which keeps elbows slightly bent to maximize your ideal strength in order to exit the seat. 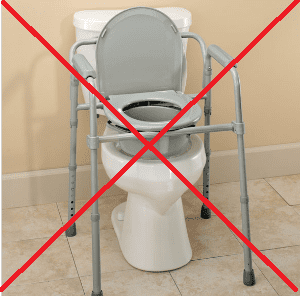 The low angle of the TILT® Toilet allows for an easy lateral transfers from mobility devices and transport chairs. In the down position, the arms are lower than the seat for smooth slide board transfers. Click here to start the order process, or call us now at our Portsmouth RI center at: 401-293-0415. You can place your order by phone or make an appointment to visit our showroom to see all of our safety products and home modification service options.